I'm very pleased to announce that I have recently finished working on my fifth book cover artwork collaboration. Timing is the follow up to Far from the Spaceports, which was the first in a series of science fiction novels written by my good friend Richard Abbott. While the first book was set on a series of fictional asteroids called the Scilly Isles, situated well outside the orbit of Mars, Timing is set in a number of locations, including Jupiter and Mars. 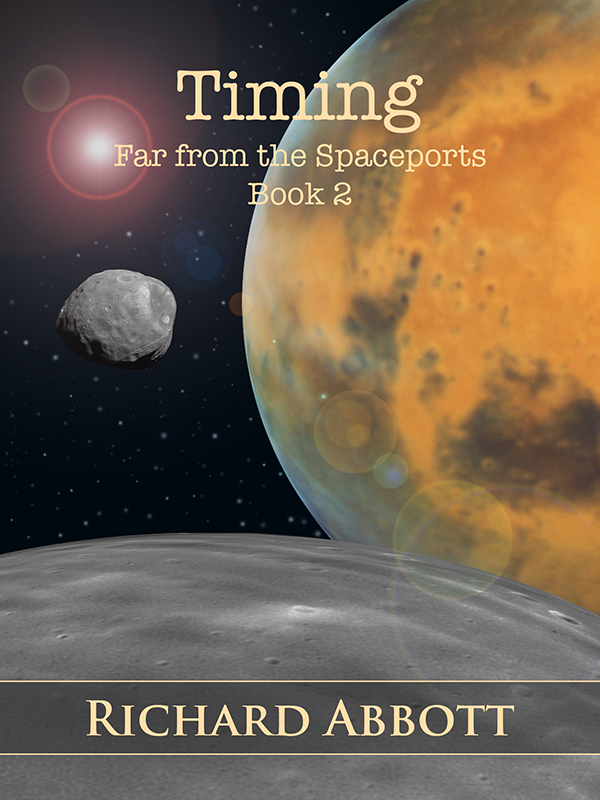 After a few discussions with Richard, we decided that Mars would make a great backdrop for the book cover, and would provide the basis for a nice warm colour palette, something not usually associated with outer space. It would certainly look a lot different to the cool blues and greens used on the first book cover. Once that was decided, we also decided to incorporate some other astronomical objects, specifically, the moons that orbit Mars. There are two moons, Phobos, which is the smaller of the two moons seen here, and Deimos, which is at the bottom of the page, and orbits further away from Mars than Phobos. Obviously, with such an excellent public domain library of images available from NASA, it didn't make sense to try and create the main elements of the cover from scratch, and using actual images brings a lot more realism to the cover. I must admit that I have a small confession to make though! The image of Deimos is not actually a picture of Deimos at all. It's an image of Ceres, the largest object in the asteroid belt that lies between Mars and Jupiter. Artistically, I thought it worked better in the composition than the real Deimos! Other than positioning elements, and ensuring the composition worked, the bulk of the Photoshop work here was done in applying textures and blending various objects with each other to ensure smooth transitions. However, with this second science fiction book cover under my belt I definitely feel a lot more confident about using Photoshop, although I still have a huge amount to learn. I've very much enjoyed working with Richard to create both of these science fiction book covers, and can't wait to get started on the next one. I wish Richard every success with the book, and hope you'd like to give the series a try. Timing is available now on Kindle (Amazon UK, Amazon USA), and is also available in paperback and ePub formats.